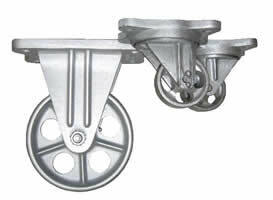 The cast iron swivel and rigid casters with cast iron wheel and no bearings below are rated for up to 1600 degree Fahrenheit (871 degree Celsius). We offer a standard grease up to 275 degree Fahrenheit (135 degree Celcius) and higher temperature grease up to 475 degree Fahrenheit (246 degree Celsius) by request. Use at temperatures above these will require an application specific lubricant added at your facility; the casters can be supplied without grease by request. The Bond 3A single ball race swivel caster and the companion 1-A rigid casters are unusually sturdy, efficient and economical to buy and maintain. They are made of semi-steel and when combined with the plain bearing semi-steel wheel, are well suited for high temperature applications. They are also available with hard and soft tread rubber wheels. Construction: Cast semi-steel top plate, cup and legs provide excellent resistance to impact and abuse. King Bolt: Rivet type with large steel washer for strength. Axle: For roller bearing wheels, bolt and nut construction is used. Rivets are used on plain bearing wheels, except for 2" thru 4" solid rubber wheels which use a cotter pin axle. Lubrication: Pressure fittings for swivel and straight roller bearing wheels. Oil holes are provided for plain bearing semi-steel wheels. Companion Rigid Caster: The 1-A Series rigid caster is a one peice semi-steel casting with generously reinforced sections for extra strength. This double ball race design provides an economical, yet highly durable caster for general factory purposes particularly where ball race protection is required. Swivel Bearing: Two large diameter ball races on the same plane placed in the proper position in relationship to the axle load provide easy swiveling and added life. King Pin Bolt: Special square headed king pin bolt is equipped with slotted nut and cotter pin that fits into the square socket in the base plate and can not become loose. Axle: A T-head axle coupled with the double rib fork design prevents the axle from turning. Lubrication: Pressure fittings are provided in wheel hub and in the raceway. The Bond 36-A and the companion 1-A casters are used for rugged service in factories and industrial plants where impact and other abuse are common. The design of the double ball race swivel assures long service life. Construction: The base section and fork are designed to provide the optimum distribution of metal in each section for strength and stress absorption. King Bolt: The high strength bolt is totally surrounded by an exceptionally large boss section relieving the bolt of all side thrust. A large hardened steel washer is held rigid against the boss section for additional strength at this point. The king bolt is secured by a slotted adjusting nut with cotter pin. Swivel: Two deep, smoothly rounded ground raceways of almost equal diameter, placed one below the other provide a double level full ball bearing swivel for smooth easy swiveling and long life. Lubrication: Pressure fittings in swivel and wheel hub. ©Copyright 2008 Bond Casters and Wheels. All Rights Reserved.